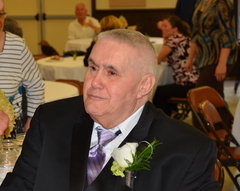 Ray “Butch” Irwin passed away surrounded by his family on February 18, 2018 at the age of 76. Ray was born in Cleveland to George and Anna Irwin. He lived most of his life in the Barberton Norton area where he resided with his family. He enjoyed hunting, fishing, golfing and camping at Berlin Lake. He was an active member of S.A.R.A.’S Ham Radio Club. Ray was a machinist at B&W where he retired after 30 years. Ray leaves behind his wife, Carol, of 56 years, children, Kim (Rick) Robbins, Jodie (Brad) Burton and Brian (Heidi) Irwin. He also leaves behind 6 grandchildren and 7 great grandchildren. He is survived by his sister Judy (Marvin) Ball, aunts, Ruth McLaughlin and Mary Irwin. He’s taught us all hard work, loyalty, dedication and what it means to be a father and a husband. He will be missed by all and kept forever in our hearts. Raymond is now at peace with his Lord and Savior, Jesus Christ. Per Ray’s wishes, cremation has taken place and no formal services will take place. A special thanks to the staff of Pleasant View Health Care Center for their love and Care.